Fortunately, or unfortunately I have no digital photos of me at camp, but if you look at the gallery of photos on the Hyde Bay web site for 1963, image number 19 shows a wimpy little kid to the left of the Land Rover and Darryl Young, that kid is me. I was the young sniveling little camper that most likely drove my first counselor, John Diamond, to distraction. I came to Hyde Bay like many, through a connection with the Gilman School in Baltimore, Maryland. My father, Hunt Hilliard, a great man, who many of you had the privilege to know and Jack Garver taught together a Stemmers Run Junior High in Baltimore County in the 1950’s. Jack taught art. My father was an industrial arts teacher. When Jack took a position at Gilman, he learned the headmaster, Henry Callard, wanted to start a shop program. Jack recommended my father, and eventually my Dad also took a position at Gilman. When Jack decided to no longer work at Hyde Bay, Jack recommended Dad to Mouldy, and Mouldy wisely hired my father. That was the summer of 1960. I was six years old. 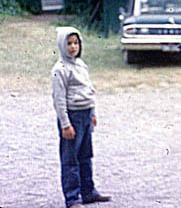 I lived with my parents in their cabin for two years before becoming a camper at the age of 8. I was very fortunate to spend my summers at Hyde Bay from 1960 to the camp’s last season in 1969. I grew up at Hyde Bay, and I loved being at camp. I became an adolescent who loved sailing (but not racing), the camping trips, and archery. I became a strong but not a fast swimmer. Any of the “horse counselors” will tell you once a year I had to be dragged to the stables to ride. I was scared to death of those animals. I was and am not very athletic, so I was not the hero of a Chenango baseball game, nor did a get to run on the field at Doubleday Park. Not even the great Fred Gale could teach me how to play tennis. The last season of camp I was a fairly responsible Senior UL. The most poignant memory I have of camp was the summer following camp’s closure when the Picketts, the Hilliards, and the Davisons closed the camp. One evening as the sun was setting; I was sitting on the dining hall porch alone with Mouldy. It was beautiful. The sky was a clear blue. Otsego Lake was becoming Glimmerglass. I must have said how much I will miss this. Mouldy looked at me and said, “This will always be mine and yours. No matter what is here. This is ours. No one can take that away from us.” He was right, that evening is still etched in my memory, and Hyde Bay is still his, mine, and ours. I never was a counselor at Hyde Bay. The summers after we closed the camp I was a counselor at a back packing camp in the Adirondacks, a day camp in Baltimore, and an in residence camp in Maine. I enjoyed the settings. I enjoyed working with the kids and the staff, but none had the same feel as Hyde Bay. They did not have the same atmosphere as Hyde Bay, where campers were allowed to excel in those areas that interested them and they were best suited, a setting in which boys and young men were caringly taught how to work together and respect one another, while growing as individuals. As a young adult, I had a one of many conversations with my best friend, my father. I wanted him to tell me what career I should pursue. Instead he told me do something I enjoyed; to do something that helps people, and pursue a career that would permit me to support myself and my family. Three years later I became a Baltimore City Police Officer. The first seven years I worked as a patrol officer in some of Baltimore’s most stressed neighborhoods. I saw a lot of violence, and I handled a lot of violent situations. However, I learned that only a small percentage of the residents of those neighborhoods were involved in crime. Behind that thin criminal veneer, most of the community’s members were going to work each day, trying to live their lives, and raise their families in a difficult setting. I found it rewarding that I could, in some small way assist them, by making their lives a little safer. 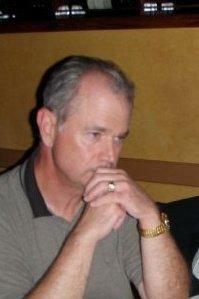 I served the city for 27 years, retiring from the department as a Major. At the time, I was the Director of the Communications Section, which operated the city’s 911 center and its police dispatch system. I loved being a cop. I am currently the Community Services Director for the HARBEL Community Organization. HARBEL is a non-profit serving the communities of Northeast Baltimore. I assist the leaders of our over 30 member communities in dealing with the issues that threaten community stability: crime, housing, zoning, education, transportation, sanitation, and problematic liquor establishments. I have found this to be very rewarding work. I live in Towson, Maryland with my wonderful wife, Georgia. We are active in our Episcopal church, and we enjoy the company of great friends and family. We are rabid fans of the Baltimore Ravens, and we firmly believe they will soon again be the champions of the National Football League. We former Hyde Bay campers do not have concrete references for our camp. We cannot show people an active operating camp site. We cannot point to buildings that now serve as a dining hall, a theatre, or a workshop. I have read the biographies of the former campers on this web site. They are successful men. They are men who have rendered great service to their nation, cities, and communities. To steal a phrase from some of our country’s proud universities, they compose the “Hyde Bay Nation”, and they are the camp’s legacy.